The Epson Home Cinema 2150 and Optoma HD39Darbee--both selling for $899--are one step up in price from the most basic entry-level home theater projectors. In both cases, the extra money buys video processing features you won't find on lesser models, a longer range 1.6x zoom lens, and a modest vertical lens shift that makes installation a bit easier. One of the more important differences between the two projectors is the advanced video processing each includes. Only the Epson HC 2150 offers frame interpolation for smoother motion and judder reduction in camera panning sequences, while only the HD39Darbee includes DarbeeVision for enhancing detail, contrast, and a sense of depth. Also important are differences in brightness and contrast, although both are the opposite of what you would expect from the specs. The HD39Darbee has the higher brightness rating, at 3,500 ANSI lumens, compared with 2,500 lumens for the HC 2150. However, we measured both at essentially the same brightness in their brightest modes, and the HC 2150 is brighter in the modes you're most likely to use. That translates to the HC 2150 delivering more saturated color in higher levels of ambient light and gives it the advantage in a brightly lit room. The story for contrast follows the same pattern with the roles reversed. Though the HC 2150 has the higher contrast rating, the HD39Darbee actually has visibly better contrast--at least for 2D. In the dark or in dim lighting, that gives it more vibrant color and a greater sense of depth. With 3D film and video, the HC 2150 delivers both higher brightness and better contrast, but unless you watch 3D a lot, that won't matter as much. In any case, which of these projectors is the better choice for you depends a lot on the ambient light level you'll be using it in. The Technologies: 3LCD vs. DLP. As with any comparison between a three-chip 3LCD projector and a single-chip DLP projector, many of the differences between them come from the technology each uses. In this price range, for example, DLP models like the HD39Darbee usually offer better contrast than LCD models like the HC 2150. That holds true for these two projectors and is a key advantage in a dark room for the HD39Darbee. Two less important differences in this case are rainbow artifacts and the need for a dust filter. The HD39Darbee's DLP engine, which updates colors sequentially, can produce rainbow artifacts. The HC 2150 doesn't because its three chips display all primary colors in unison. Though rainbows can be a problem on some DLP models, the HD39Darbee produces these artifacts so infrequently that they aren't an issue. An equally small disadvantage for the HC 2150 is its dust filter, which needs to be cleaned and occasionally changed to avoid dust build up and overheating. That's standard for 3LCD models. The HD39Darbee doesn't need a dust filter. Lenses. Both of these projectors have a 1.6x optical zoom lens. The throw ratio ranges are almost identical. For any desired image size, you can position the HC 2150 very slightly closer to the screen but the difference isn't enough to matter in most cases. For example, to get a 120" diagonal image, the throw range for the HC 2150 is about 11.5 to 18.75 feet, compared with roughly 12 to 19.5 feet for the HD39Darbee. Keystone Correction and Lens Shift. Both projectors offer vertical keystone correction and a modest vertical lens shift. The HC 2150 also has horizontal keystone correction and four-corner correction. 3D Video. The HC 2150 offers Full 3D support with RF glasses. The HD39Darbee supports DLP-Link glasses as shipped, and includes a VESA 3D sync port to let you connect a $39 optional external emitter or third party emitter for RF glasses. As is standard, it can work with only one type of glasses at a time. Connections. 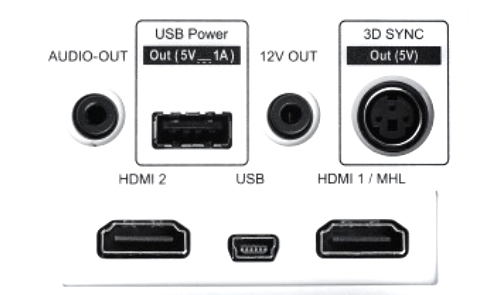 Both projectors offer two HDMI ports with MHL on one port. The HC 2150 includes three additional connection choices: A VGA port, a USB Type A port for reading files directly from a USB memory, and built-in Wi-Fi. Total Cost of Ownership. Although the MSRP for these two projectors is the same, the HC 2150 may cost less over its lifetime depending on the number of hours you plan to use it. Replacement lamps cost an extraordinarily low $49. The HD39Darbee's lamp is $229, but the original may last long enough that you would never have to buy one. Lamp life in the highest power mode is 4,500 hours for the HC 2150 compared with 4000 hours for the HD39Darbee. In Eco mode, however, the HC 2150's lamp rating is 7,500 hours, compared with 10,000 hours for the HD39Darbee in Eco mode and 15,000 hours in Dynamic Black mode. Dynamic Black works like an auto iris to make dark scenes darker, while also lowering power use and extending lamp life. Keep in mind that the brightness for both projectors varies with the lamp power mode and color mode, so you need to consider which modes you're likely to use before you can project your long term costs. Which projector will give you a better looking image depends on the ambient light level. In a dark room or dim lighting, the HD39Darbee has the advantage because of its better contrast. In a family room with the lights on, the HC 2150's brighter image gives it more vibrant color and a greater sense of depth. The HC 2150's rated contrast ratio is 60,000:1 compared with 32,000:1 for the HD39Darbee. Here we have another example of contrast ratings being notoriously uninformative. If you are projecting a solid black, 0 IRE test image, the HC 2150's black is indeed darker than the HD39Darbee's black, thanks largely to its auto-iris darkening the screen. However, once you add any subject matter to the image at all, the HD39Darbee's black is either as dark or darker, while its DarbeeVision gives bright areas--like bright lights in a nighttime cityscape--a boost to make them brighter. The result is higher contrast for the HD39Darbee in real life use. The advantage appears in both dark scenes and brightly lit scenes. And it gives the HD39Darbee the greater sense of depth in the dark or in dim lighting as well as more saturated color. The HD39Darbee's high contrast even helps it stand up to high levels of ambient light better than you might expect from its measured brightness. With lights on, however, the HC 2150's higher brightness still delivers more saturated color and a better sense of depth. Viewed side by side in ambient light, the HD39Darbee's colors look a little washed out in comparison. Color Quality. Most of the color modes for both projectors are within the realm of usable--which is to say, not obviously awful--straight out of the box. The only exception is the HD39Darbee's brightest mode. Its green bias is impossible to ignore, and I couldn't find any settings that would make it acceptable for film and video. Compared with our calibrated reference projector, the HD39Darbee's other modes are all either just a touch green or a touch red with default settings, but not by enough to notice without something to compare to. Reference mode, which claims to be nearly 100% accurate Rec.709, offers the best color accuracy but the lowest brightness. It is also the only mode I could adjust to give a close match to the reference projector without losing brightness. 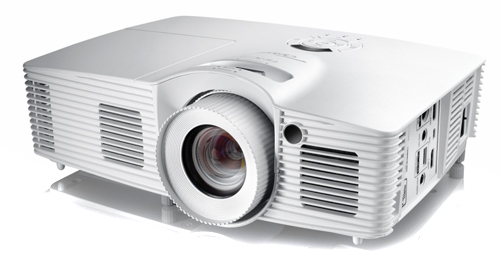 Compared with the reference projector, the HC 2150's color modes are all slightly green with default settings. As is typical, the brightest mode, Dynamic, showed the most bias. Bright Cinema, the second brightest mode, was easy to adjust to match the reference projector. Video Processing Enhancements. The HC 2150 has a Frame Interpolation (FI) system with four options -- Off, Low, Medium, and High. Low does a little to smooth out motion judder while showing only a hint of hyper-reality known as the digital video effect. Both effects are noticeably more obvious at Medium and High. Many people find the digital video effect from Frame Interpolation distracting when watching movies, but a useful reality enhancement when viewing live performance concerts and recorded video. You can activate it or not as your tastes dictate. The HD39Darbee doesn't offer Frame Interpolation. On the other hand, in addition to improving contrast, Optoma's DarbeeVision makes images crisper overall and enhances details significantly. You can adjust DarbeeVision's settings from 0 to 100. Your preferred setting will likely vary with content, however. With an animated feature you'll probably prefer a high setting to get maximum crispness. With a movie close up of a face at the same high setting, however, it will bring out every wrinkle, mole, and other skin imperfection to the point of being distracting. If you don't push it too high, you can get a level of detail that isn't distracting, but still noticeably sharper than the HC 2150. The HC 2150's Detail Enhancement feature isn't in the same league. 3D Film and Video. The HC 2150 is the clear favorite for 3D. The HD39Darbee's black isn't as dark as with 2D, and the contrast isn't as high, which gives the HC 2150 better contrast. In addition the HC 2150 has the advantage of two 3D color modes. The dimmer one and the HD39Darbee's only 3D mode both have the typical loss of brightness for 3D modes compared with the same projector's 2D brightness, and are bright enough for a dark room or dim lighting. The second HC 2150 3D mode is noticeably brighter--though still less bright than its 2D modes--delivering an extra boost for 3D brightness with only a small loss of color accuracy. As tested, the HD39Darbee doesn't handle 3D gracefully. Once in 3D mode, you need to choose the factory Reset option before it can handle 2D properly again and let you use any of the 2D color modes. Optoma is aware of this problem. At this writing, it is working on a fix, which it expects to make available as a firmware update. Brightness. As always when comparing DLP and 3LCD projectors, lumen ratings are not always apples-to-apples due to the effects of DLP's Brilliant Color feature. Brilliant Color's most typical function is to add white light to boost the picture's brightness which can affect color quality and saturation. This may or may not be desirable in any particular viewing situation, but in any case the 3LCD products do not have an equivalent feature, so ANSI lumen measurements may or may not be directly comparable. Unlike many DLP models, the HD39Darbee takes this into account by using different Brilliant Color settings for the defaults in different color modes. The settings run from 1 (off) to 10 (the highest). For Bright mode, the default is 10. For Reference mode, which offers Rec.709 color, the default is 1. Other modes have intermediate settings. Cinema, for example, sets Brilliant Color at 5, which gives a good compromise between adding a little extra brightness and still maintaining good color fidelity. Optoma rates the HD39Darbee at 3,500 ANSI Lumens. Epson rates the HC 2150 at 2500 ANSI Lumens. The measured ANSI Lumens for the default settings for each color mode in both the brightest and Eco modes for both are as follows. All measurements were taken with the zoom lenses at the widest angle setting. Eco modes. Both the HC 2150 and HD39Darbee Eco modes are just under 70% as bright as their brightest power modes. Zoom lens light loss. The HC 2150's lens curtails hardly any light at the telephoto end of the range compared with the wide angle position. The 8% loss of brightness is far less than with most 1.6x zoom lenses and little enough that you don't have to consider it when choosing how far to position the projector from the screen. The same is not true for the HD39Darbee's 1.6x zoom lens, which curtails light by 33% at the telephoto end compared with the wide angle position. For maximum brightness, you'll want to position it as close to the screen as possible for the image size. Brightness uniformity. The HC 2150 delivers noticeably better brightness uniformity than the HD39Darbee, at 83% compared with 69%. The variation in brightness is easy to see on the HD39Darbee with a Word document, for example, but hard to see with the HC 2150. Fortunately, this isn't a serious problem for the HD39Darbee with film or video. The human eye tends to accept the brightness variation as part of the original scene rather than see it as a flaw in the projected image. Rainbow artifacts. Projectors like the HC 2150, which use three chips and show all primary colors at once, don't produce rainbow artifacts. Single-chip DLP projectors can because they show colors in sequence. However, the HD39Darbee shows these artifacts so infrequently that it is hard to believe that anyone would find them troublesome. Onboard audio. Both the HC 2150 and HD39Darbee include 10-watt mono speakers, and both offer similar volume and audio quality. At 7.7 pounds for the HC 2150 and 6.2 pounds for the HD39Darbee, either is light enough to take to the backyard for a movie night and both can put out enough volume for a small group without needing an external audio system. Input lag. We measured the input lag for the HC 2150 at 28 ms. with Frame Interpolation off, 70 ms. with FI at Low, and 98 ms. at Normal and High. The Fine and Fast settings make no difference. The HD39Darbee varied from 33 to 36 ms. depending on the color mode and setting. Both projectors have an acceptably small lag for most moderately serious gamers, though the HC 2150 at its fastest has a slight edge. Fan Noise. The fans on both the HC 2150 and the HD39Darbee are loud enough in their high power modes so you can hear them easily from eight or ten feet away during quiet moments in a movie. The Eco modes for both are significantly quieter. Unless you're particularly sensitive to fan noise, or are sitting just two or three feet away, you're unlikely to notice either during quiet moments. 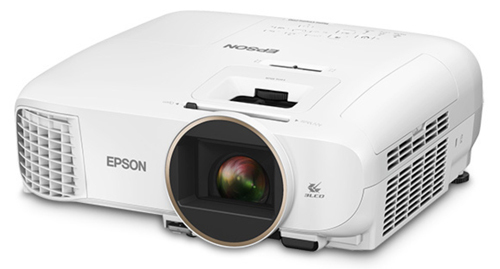 The Epson Home Cinema 2150 and Optoma HD39Darbee both offer excellent image quality and performance for $899. Both are solid choices for either an inexpensive home theater projector for permanent installation or a portable projector you can set up for special occasions. However, there are some key differences between them that will make one or the other the better choice depending on your intended usage. If Full 3D support is an important consideration, the Epson HC 2150 is the obvious pick; its two 3D color modes deliver brighter and higher contrast 3D pictures than you get with the HD39Darbee. If you don't consider 3D important, your best choice will be based on the ambient light level in the room where you plan to use the projector. In dark or dim lighting, the Optoma HD39Darbee delivers more saturated color, higher contrast, and a better sense of depth, plus a crisper, more detailed image thanks to DarbeeVision. In a brightly lit family room or living room, the Epson HC 2150's higher brightness translates to more saturated color and a better sense of depth. Its Frame Interpolation also helps to enhance the live-action look of live and recorded video.